What is it about New York that I get a great thrill when I step out of the Port Authority bus terminal into the chaos and throngs and traffic of the city? I think it’s the chaos and the throngs and the traffic. I get that thrill, too, seeing the skyline while riding in on the bus from New Jersey. Having grown up in the suburbs of New York I guess I just love renewing my love affair with this greatest of cities. 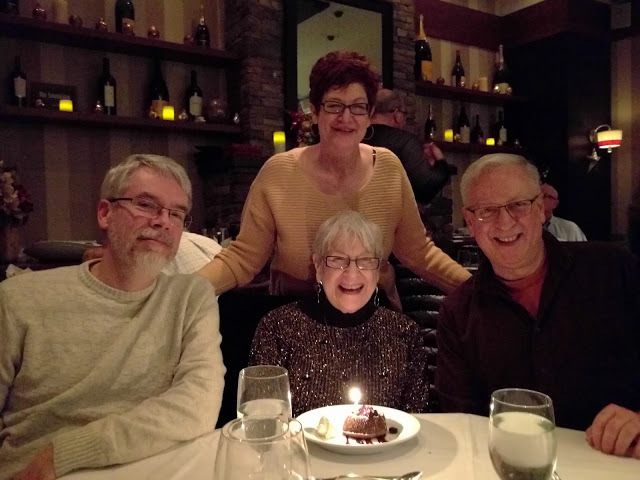 Today was Mom’s birthday, so we went in to go see An American in Paris. 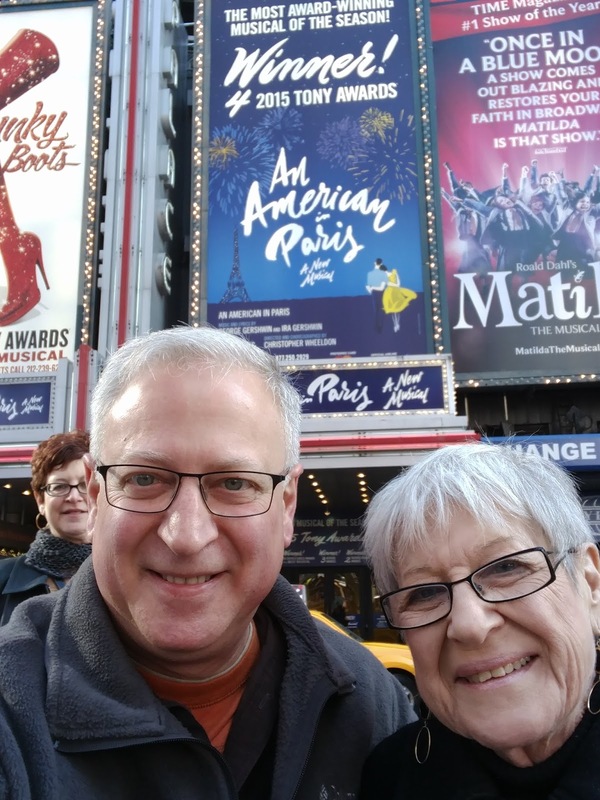 My sister and her husband were (unbeknownst to Mom) meeting us in the city for dinner after the show, but they managed to find us when we were taking a selfie in front of the theatre, and she photobombed us! The four of us got a quick but nice lunch and then went to our respective shows (they got last‐minute TKTS for Fun Home, which Mom and I are seeing on Sunday). An American in Paris was absolutely stunning. It roughly follows the story of the movie, but it adds a number of interesting plot elements that made it more compelling. After the first act I thought it was good, but it was the second act, and especially the final ballet, that knocked my socks off, and I may have wiped away a tear or two — it was just that beautiful. And who doesn’t love that gorgeous Gershwin score? We had gotten in early and were walking down 42nd Street on the way to the theatre when we passed Mme Tussaud’s, and Mom wanted to go in, so we did. It was entertaining enough, though not worth the cost ($80 for the two of us). Still, I was happy to get a picture with my girl Judy. After the theatre we met up and had a nice birthday dinner at The Glass House Tavern. After dinner, our waiter came by and asked us if we were heading toward 42nd Street. It seems there was a suspicious package left in the vicinity of Port Authority, and the bus terminal was evacuated. Mom and I started considering alternative plans, but it turned out to be a false alarm, order was restored, and we were able to catch our bus back to central New Jersey. All in all, a great day of theatre and family and food in the world’s greatest city. I am excited to be spending all of next week in the city, and I’ll be back to share all the details.